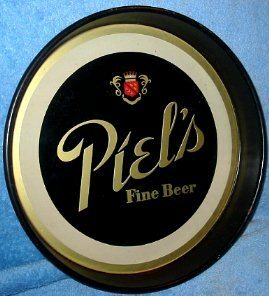 Piels Fine Beer tray. 13 inch round. 30’s vintage. Nice example, but not as clean as photo depicts. These old black trays are really hard to find completely clean. There is some light scuffing in the black background not seen in the photo. You should be pleased if not looking for a really clean one.